Alphonse Ratisbonne was a French Jew who was miraculously converted while at Rome in the Church of San Andrea della Frate. His brother had previously converted and become a Catholic priest, but Alphonse hated the Catholic church and vowed never to enter. This is the story of the power of prayer and a miracle of grace. It is a powerful, delightful, and consoling story that every apostolic Catholic should know. This edition is faithful to the original published in 1842. We have given in this volume a literal translation of the original accounts of the conversion of M. Alphonse Ratisbonne. The attempt to construct an independent narrative would be presumptuous in itself, and would lose the simple force and freshness of these genuine documents. Those who know the scrupulous and almost suspicious care with which the pretensions of any alleged miracle are tested at Rome, will feel the value of the decree of the Cardinal-Vicar which is prefixed. Baron de Bussières prefaced his first edition with a declaration, that he claimed for his narrative only that measure of assent which may be granted to any ordinary statement, resting on human evidence alone; this decree has raised the conversion of Mr. Ratisbonne to the position of an accredited miracle. It is both sad and strange to observe the air of superb disdain with which miracles such as this are set aside, even by those who seem least removed from the Church, and who profess to accept the miracles of Holy Scripture on their own evidence, and to be familiar with the laws of moral reasoning. And yet, surely, those who reject this statement as an imposture or a delusion, should feel bound to show wherein it lacks the criteria of a true miracle. We may assume that they will be unwilling to affirm that the power of working miracles was restrained within the limits of the apostolic age; they know that this hypothesis is fatal to historical Christianity, and belies the promise of its inspired records. Nor will they say that a miracle is so improbable a thing in the kingdom of God that no amount of testimony can render it credible; they know well, that on this view, they could hardly rescue the miracles of the Gospels from the hands of unbelievers. They must rest their rejection on one of these grounds: they either regard the evidence for this particular miracle as insufficient or untrustworthy, or they shrink from doctrines and practices which seem to them imbedded in it, or presupposed by it. Yet they have learned from a great authority amongst themselves,1 that objections to any revelation from God, as distinguished from objections to its evidence, are frivolous. It is not competent to them to set aside credible testimony to a miracle, simply because that miracle carries with it theological consequences which they deem at variance with the general scheme of religion. Nor would they thus reserve any right to blame the Jews for rejecting our Lord’s miracles. The only question which they can logically entertain is the evidence for this particular miracle — the apparition of the Blessed Virgin to Alphonse Ratisbonne in the church of St. Andrew at Rome. And if we weigh the character of the witness and his competency — the improbability of his being deceived or wishing to deceive — the simple fact of the entire change wrought upon him in a moment, in the conversion of his heart and the illumination of his mind; the consequences of his testimony to himself; and then, the many years which have tested his sincerity and his stability; — if we weigh all these circumstances, we may ask whether it is possible to decline to receive his testimony on any grounds which would not excuse the Jews that dwelt at Damascus for refusing to credit the conversion of Saul of Tarsus, and Festus for deeming him mad. We repeat, that those who feel that there is no antecedent improbability in the occurrence of miracles, that the later miracles cannot be discredited on a priori grounds without shaking the credit of those of the Gospels, are bound to justify their rejection of this miracle by impeaching its evidence. This is the only issue which a Christian can properly raise; and that testimony cannot be trivial or indifferent which the Church has stamped with the seal of its acceptance. In proof that the Blessed Virgin is honored as the Mother of mercies, temporal and spiritual, the author before us appeals to the Baron de Bussières’ account of M. Ratisbonne’s conversion from Judaism, which he distinctly attributes to the immediate operation of the Virgin Mary; for he relates, that it was effected by her actual appearance to him. Now, what is meant to be granted, and what is meant to be doubted here, we do not know. 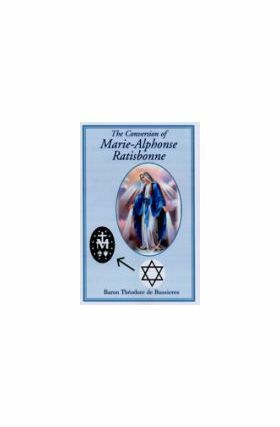 We suppose that no one doubts that M. Ratisbonne, from a Jew, did become a Catholic, and has become a religious; having abandoned home and friends, and given up a long-cherished alliance. Any one might as well deny that Sir R. Peel is Prime Minister. That he went into the church of St. Andrew a Jew, and came out a Christian, is attested upon evidence as certain as any fact can well be that of trustworthy and honest men, who saw him and spoke with him before and after. For the change something must account. That it was a true conversion from Judaism to Christianity, with great temporal sacrifices, is clear; and such a conversion must have been the work of divine grace. How communicated is the question. The only witness can be the convert. He tells us that it was through an apparition of the Mother of God, who instructed him in the mysteries of our holy religion. Are we to believe that a person is chosen by the Divine Goodness for an object of a most singular act of grace, at the moment that he devises and tells an abominable falsehood, to rob Him of the glory of it, and give it to another, by feigning a vision of the Blessed Virgin? What does the author of the Voice mean to throw doubt on? on the apparition, as for such a purpose impossible? or on the consequences drawn from it? Surely not on the latter; for if the vision was true, it was right to consider the blessed Mother of God, not as the source, but as the channel, of a great spiritual mercy. If he wishes to insinuate that it would be derogatory to God’s honor, or incompatible with His revealed doctrines, to believe such a mode of communicating grace and religious instruction possible, and consequently, that the whole must be a figment or a delusion, we will, in answer, relate another similar story, in which not a Jew, but a bishop, was the party; and we will premise that we have it on the best authority. The person to whom we allude was a young man of singular piety and virtue. Left young an orphan, he devoted his youth to study in a celebrated university. There his assiduity in learning was surpassed only by the purity and innocence of his life, which stood the test of severe trials, and escaped the snares laid for him by profligate companions, jealous of his virtue. Having made himself master of all profane learning, he entered on a course of sacred studies, under the most celebrated professor of the day, and soon made considerable progress. He was, however, while yet young, put into orders, and even named bishop, before he considered himself well enough grounded in theological knowledge; though probably his humility led him to exaggerate his deficiencies. He found himself quite unequal to the task of preaching the Divine Word; and on the eve of his first undertaking this duty, he lay sleepless on his bed, in agitation and anxiety. Suddenly he saw before him a venerable figure of an old man whose countenance, attitude, and garb bespoke great dignity, but who, at the same time, appeared most gracious and affable. Terrified at this appearance, he leaped from his couch, and respectfully asked who he was, and for what purpose he had come. The old man replied, in a gentle voice, that he had come to calm his doubts and solve his difficulties. This declaration soothed his fears, and made him look towards his visitor with a mixture of joy and awe; when he perceived, that by steadily pointing with his hand towards the other side of the apartment, he seemed to wish to turn his attention in that direction. Thither be consequently turned his eyes, and there he beheld a lady of peerless majesty, and of more than human beauty, so resplendent that his eyes could not bear the brightness of the vision, but he must needs bend them and his countenance down, in reverential awe. Thus be listened to the conversation of these two heavenly beings, which fully instructed him on the subjects whereon he felt anxious, and at the same time informed him who his gracious visitors were. For the lady, addressing the other by the name of the Evangelist John, requested him to instruct the youth in the mystery of heavenly piety; and he replied, ‘that he was ready to do even this, to please the Mother of his Lord, seeing that she desired it.’ And accordingly he did so. Such is our counterpart to the narrative objected to by our author, respecting M. Ratisbonne’s conversion. Now, before giving the name of our authority for this wonderful history, or of the person to whom it refers, we will only beg our reader, if not sufficiently versed in ecclesiastical biography, at once to answer both points, to say to what church or religion he considers either the writer or the subject of this anecdote belongs. Could he believe us if we told him that it happened to Bishop Ken, or Bishop Wilson, or Archbishop Laud; or that we had transcribed it, as gravely told by some Anglican clergyman in a life of any of them? We are sure he could not. The idea of a Protestant bishop learning his faith from a vision of the Blessed Virgin would be deemed repugnant to every principle and every feeling of the religion. But were we to tell the reader that the bishop spoken of was St. Alphonsus Liguori, or even St. Charles, and the narrator an Italian monk or priest, he would at once allow, that such an account, from such a pen, concerning such a person, was perfectly consistent with the principles of both; and though, if a Protestant, he might declare that he did not believe the story, he would acknowledge that it did not surprise him to find it in such a place. It must, then, be a Catholic, and not a Protestant, who thought or said he saw such a vision; and it must be a Catholic, and not a Protestant, who has recorded it, as believing it. And so it was. The bishop who thus learnt his faith was St. Gregory Thaumaturgus, only little more than two hundred years after Christ; and the recorder of the vision is the brother of the great St. Basil, St. Gregory, Bishop of Nyssa. This would have been a nice anecdote for our ancient note-taker upon the doctrines of Catholics. The real reason why miracles such as this are rejected with scorn, or passed by with indifference, is not their antecedent improbability nor the inadequacy of their evidence; it is that they imply and render sensible the position and power of the blessed Mother of God. The Protestant cannot endure that glad and graceful vision of the Mother of Divine Grace — radios evibrans misericordiae — as Catholic piety delights to image her. It is an offence to him. It is something so intolerable to him, that, in his antipathy, he forgets all canons of moral reasoning; his conceptions and definitions become confused, and he allows this consoling vision to neutralize the positive evidence, that the Church which discloses it is alone of God. And yet waiving in thought what we can never forget in fact, that clear voice of the Church which is the Catholic’s warrant of faith, why should it be thought a thing so violently incredible that the Mother of God should occupy the position, and exercise the powers, ascribed to her by the Church? Surely there can be no natural and necessary improbability in that which East and West combine to affirm. Except in the fancies of a modern and very small section of the nominally Christian world, there has never been any consciousness of an incompatibility between our assigned office and the Gospel. Her glories and prerogatives, as Mother of Christians and a special channel of grace, have not shocked the wisest and the holiest sons of the Church. Nor can those who rightly ascribe so tremendous an influence to Eve over the destinies of our race, rightfully shrink from the range of power attributed by the Church to the advocate and counterpart of Eve. It cannot, surely, be a gratuitous fancy to see in the effects of the unbelief and disobedience of the mother of all living, in the order of nature, a hint and a measure, though not a limit, of the efficacy of the faith and obedience of the mother of all living, in the order of grace. But let us observe here, that the miraculous element in the conversion narrated in this volume is simply the apparition of the blessed Mother of God, and not her intercessory power. The Catholic regards that power as a supernatural fact, a law of the spiritual kingdom, one of the powers of the world to come. He needs no miracle to teach him that. No number or splendor of miracles could increase his faith in that. They would be but verifications to sense of what he knows already, absolutely and infallibly, by the teaching of the Church; what he sees already, by the deep intuition of faith. Such a miracle as this might excite his faith, but could not be its ground or warrant. He sees the office and the prerogatives of the Blessed Virgin involved in the fact of the Incarnation. Mary, of whom was born Jesus — he needs no more. Mary, Mother of God; Mary, bequeathed to us as our mother from the Cross: the Divine Maternity includes and implies all. Her glories and her mighty powers are only its natural consequences, and its fitting adornment. Is he reminded of the absence of express command to seek her intercession? He feels that he has the command of that same Spirit by whose inspiration Scripture was written. For the Church can ever say, it hath thus seemed good to the Holy Ghost and to us. He would remind the objector, that the relation in which the Mother of God stands to us being known, the duty of religious regard to her, on Bishop Butler’s principles, arises out of that relation itself, and is an obligation of reason, binding as soon as that relation is known. It is our duty as well as our privilege to seek the intercession of those who have power with God; and he would call on the objector to produce some prohibition of so natural an exercise of that privilege. And, indeed, Catholics feel that this objection does strike at intercessory prayer in general. There, we know, an intercession, vast and mighty, which rests upon and carries out, if we may so speak, the great mediation of the Word made flesh; and that mediation is a legitimate object of desire, and consequently of petition, to every Christian man. It is for the objector to produce a command in limitation of this our right, in the covenant of grace. God’s knowledge, and are blest. Still there is a jealousy, honorable in its motive, most unwise in its conclusions, that our recourse to the Blessed Mother of Christians does in some way interfere with the simplicity of our trust in Jesus. It is impossible for those who are without, to understand the practical and ever-present safeguards of the Catholic from all error, from all excess. They cannot know, for instance, the effect of the Mass in regulating all his language and thoughts; nor how impossible it is that this perception of the greatness of the powers which God does communicate to the creature should lessen the greatness or dim the glory of those which are incommunicable. Surely it should suffice to affirm that the sole Mediatorship of the Incarnate Son of God is the very condition of all Catholic theology and practice. Like the weakness of man and the might of grace, it is a law of the spiritual order, everywhere felt, everywhere presupposed, everywhere taken for granted, underlying every statement, pointing every prayer. It is not so much a part of the Gospel, as the Gospel itself. But the intercession of the Blessed Virgin and of the saints cannot be so stated as to clash with this oneness of mediation. They cannot ask otherwise than in accordance with His will, nor apart from His great pleading. It is upon that golden altar, which is before the throne of God, that the prayers of all saints are offered, in St. John’s vision. Now this is ever present to the Catholic. However largely he may ask of our Blessed Mother — and he does ask largely — the principle of his asking and the law of its interpretation are, Tu da, per precata dulcisona (by thy sweet prevailing prayer). However wide and, to human notions unlimited, the range of power he ascribes to the Mother of God, it abides still an omnipotentia supplex, as St. Bernard beautifully says. It cannot be otherwise to him. He is never even tempted to confound the creatures with the Creator, to mistake the streams for the source. But, indeed, it is not the illumination of the mind that is needed to bring back the strayed sheep to the fold; it is the attraction of the heart and the bending of the will, and this is the work of God alone. Would those who doubt and object but meditate awhile on the solitary prerogative of Mary, on her proximity to the flesh of Jesus, and on the intensity of the mutual love that must bind together that Son and that Mother; would they but try to look at her revealed position from the Church’s point of view. with all those limitations and checks and safeguards of which they can form no notion; would they do this, not with the hard cold gaze of the intellect, but with a loving docile heart; the objections which now hang like clouds before their soul’s eye would melt away of themselves and leave no trace. To such a one we would say, in all affection, if you must reason ere you believe, remember the laws which control all moral reasoning; remember that no number of even irreducible objections3 are of weight against that which rests upon direct and positive evidence; remember that though this evidence is liable to objections, and may be run up into difficulties, it is not lost in these difficulties or destroyed by these objections; remember that those who, like St. Bernard, St. Anselm, St. Bonaventure, St. Alphonsus, have been most devout to Mary, have spoken of Jesus with the tongues of angels rather than of men; and pray — ova fortiter et fideliter. And as you gaze, you will see how the Mother of Jesus is the mother of His mystical body likewise — Mater membrorum Ejus, as St. Augustine speaks. As you fathom the import of the words, Behold the handmaid of the Lord, you will come to feel that it is a mighty plea and an availing, to say, Behold, O Lord, how that I am Thy servant, and the son of Thine handmaid; and you will soon be enabled to continue the words of the psalm, Thou hast broken my bonds asunder. We owe an apology to our Catholic readers for the length to which these remarks have extended. You can hardly grasp the reality of the difficulty which Protestants feel in the intercession of the Blessed Virgin and of the saints. You can scarcely believe that men, believing the mystery of the Incarnation, can really confound things so accordant indeed, yet so distinct, as the affiance of a Christian in Christ, and his recourse to the prayers of all saints, without intellectual weakness or moral perversity. To you the miracle related here is, if I may so speak, quite natural and in keeping; wonderful indeed, but still what you are prepared to expect from the Mother of Mercy. To you all Scripture speaks of her, in type and figure, in prophecy and promise. To you the Incarnation is unintelligible apart from her, and doctrine heterodox or unmeaning which makes no mention of her. You know that as you have loved Jesus more, you have felt for her whom He loved best on earth, whom He cannot but delight to honor in heaven — a truer, deeper, more loyal, and more trustful love; and that as your devotion to the Mother of God has gathered strength, you have known and loved Jesus with a less reserved and less reserving love. You know and feel that God has indeed done great things unto her; but it has never occurred to you that He has thereby dimmed the glory of His name. You have rather said with her — et sanctum nomen Ejus. This narrative is of conversion, of Mary’s tender pity towards those who know her not. How can we better express our thankfulness for this instance of her compassion than by praying for those to whom that very compassion is an offence and a hindrance? We know, by manifold experience — we have heard with our ears, and our fathers have declared it to us — the reality, the range, and the patience of that compassion. Let us pray for those who, from amidst their gathering gloom, are casting wistful, timid looks towards the one unwavering light, that God’s grace may still lead them on, and gently clear their way through their thorny objections, until it brings them under Mary’s smile and Peter’s royal feet.